One of the capabilities we've reserved for select clients over the past few years has been our capabilities in Search Engine Optimization (SEO) and Pay Per Click (PPC) deep-dive analysis. We feel the tools and opportunities available to us in helping form a more comprehensive online marketing strategy are now ready for prime time, for all of our clients. and most importantly, what other, closely related key word phrases are being searched and how are each of these phrases ranked based on the quantifying information above. 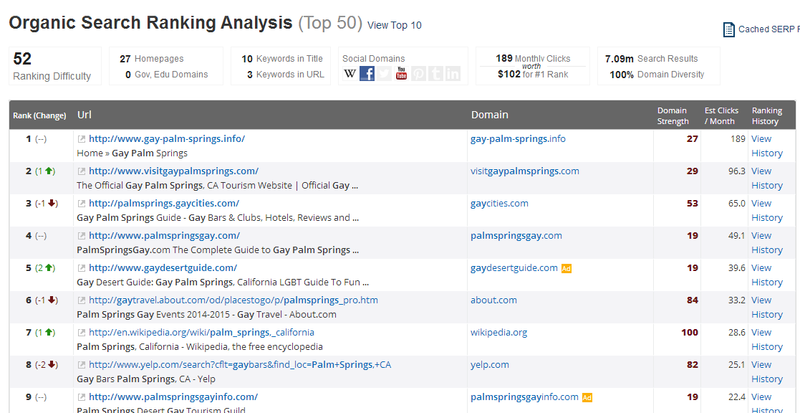 As seen in the summary above, we now have a pretty good snapshot as to what is happening for the key search term phrase "gay palm springs". 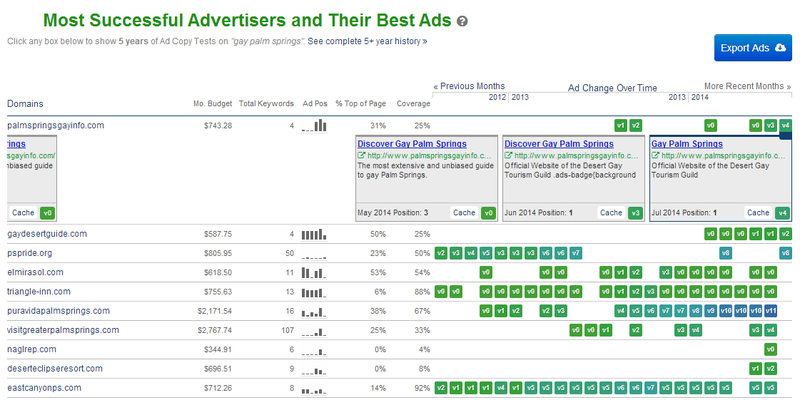 We now also know what other search terms are closely related to "gay palm springs", including how often they are searched for, how much they would cost to target in a PPC campaign, and what type of monthly budget we should plan for. Ranking difficulty is a general indicator as to how difficult it would be to improve a website's ranking based on a specific set of key words, on a scale of 1-100 (100 being most difficult). This is due to other websites competing for the same organic search placement and how well positioned they are. Next, we have an entire history at our fingertips, up to the present day, of who the various advertisers have been for these select key words, including what their ad looked like, how they ranked compared to other competing advertisers, as well as what their budget spend history and estimated dollar amount looked like. We also get a complete snapshot of what sites are appearing organically using these search terms, and how strongly positioned they are, including an estimate as to how much traffic they are receiving from these search terms as well. As a secondary offering, we can also do a specific analysis of how a client's website domain is performing in both organic and pay-per-click search, as seen above. 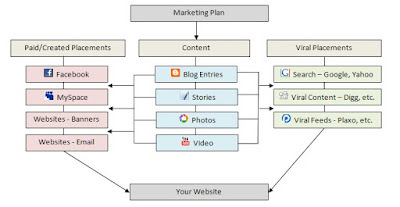 From this information, we can do a similar analysis of the SEO analysis described at the beginning of this article, as well as receive an up-to-date analysis as to what organic key words are doing best for a client's website, which ones have dropped off and which ones have gained in strength. A lot of this information an the updated changes are derived from their efforts in Interpersonal Marketing, combining content marketing, PR and social media marketing in their overall marketing mix. 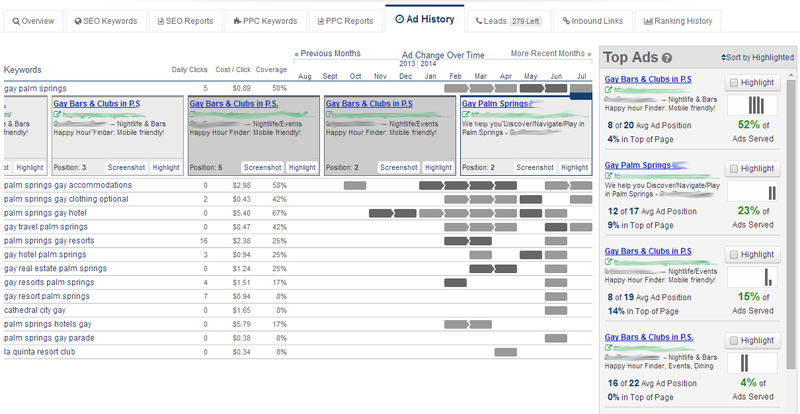 We also receive a detailed analysis as to how the client's own PPC ads have been ranking and performing, including a history of their overall position compared to competitors for the same key word ad buy (image redacted to hide client's name... this information in this report is so detailed, we felt it best). If this type of SEO and PPC analysis is of interest to you and your overall understanding of your online marketing strategy environment, please do let us know. The cost for both a key word search analysis and an analysis of your website's domain is $500. Call us at (323) 963-3653 or contact us here to get a started. Bannerizer makes it easy for you to promote ClickBank products using banners, simply go to Bannerizer, and get the banner codes for your favorite ClickBank products or use the Universal ClickBank Banner Rotator Tool to promote all of the available ClickBank products.